Bulldogs are ranked among the most popular breeds in the country and it is no wonder why. These clever, affectionate, and often goofy dogs are a joy to have around. The Bulldog is a great companion to families and other pets. We recommend a quality diet for this health-plagued breed. You can avoid some common problems simply by giving your Bulldog the best nutrition through your dog food choice. The name Bulldog applies to a number of different breeds but the breed to which it most commonly refers is the English Bulldog. Known for his wrinkled skin and friendly personality, Bulldogs make wonderful family pets and they are particularly good with children. This breed is generally easy to train and he gets along well with just about everyone he meets, even other dogs and cats. The English Bulldog is a medium-sized breed known for his short, stocky body and wrinkled skin. These dogs have an undershot jaw and a massive build which can make them look a little intimidating at times but inside they have a heart of gold. This breed is consistently ranked among the top ten breeds by the American Kennel Club (AKC) according to registration statistics, and for good reason. They are sweet, gentle, and patient dogs that love people and get along well with dogs and other pets. If you’re looking for a companion pet who will love you unconditionally for the duration of his life, the Bulldog is a great option to consider. The English Bulldog is classified as a non-sporting breed by the AKC and it is a medium-sized breed. The term “Bulldog” first appeared in literature around 1500, though the spelling was much different then. The modern Bulldog is the product of centuries of selective breeding, one of many breeds developed for the blood sport bull-baiting. After blood sports were banned, the Old English Bulldog fell by the wayside until concerned breed enthusiasts revived the breed and worked to promote what is now known simply as the English Bulldog or just the Bulldog. The Bulldog typically weighs between 40 and 50 pounds and the breed standard doesn’t require a certain height. These dogs have short legs, massive heads, and stocky builds with folds of wrinkled skin all over the body but particularly on the face. It is unfortunate but true that the Bulldog has a shorter life expectancy than most dogs of his size. While small-breed dogs can live upwards of 12 to 15 years and large-breed dogs usually live for about 10 years, the Bulldog’s average lifespan is only 8 to 10 years. This is largely due to some health problems to which the breed is prone such as brachycephalic syndrome, food allergies, bladder stones, and gastric torsion. Brachycephalic syndrome is a set of anatomical abnormalities which can restrict the dog’s breathing. 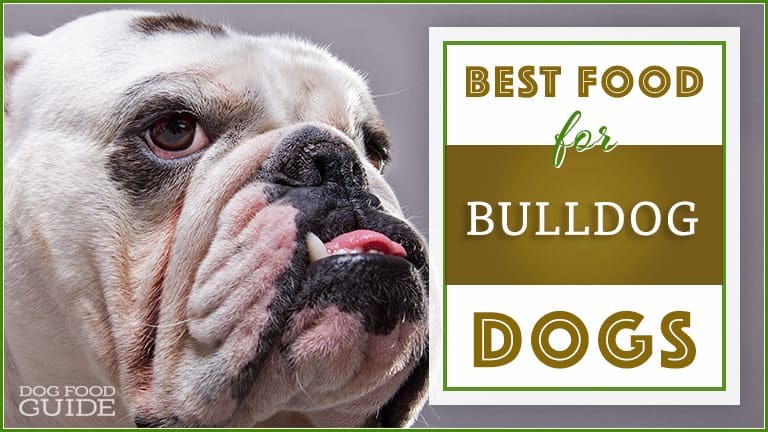 Food allergies, if left untreated, can prevent your Bulldog from absorbing the nutrients he needs and gastric torsion is a deadly condition that is common in deep-chested breeds. The best way to meet your Bulldog’s nutritional needs is to choose a high-quality dog food made with premium animal proteins and other wholesome ingredients. If you’re concerned about food allergies, think about feeding your dog a limited ingredient diet or one made with a novel source of protein and carbohydrate to limit the risk for triggering any food allergies or sensitivities. In terms of his nutritional needs, the Bulldog is not significantly different from any other breed. These dogs require plenty of protein in their diet to support their growth and development as puppies and to maintain lean muscle mass as adults. Fat provides a highly concentrated source of energy for dogs but it contains 9 calories per gram (as opposed to 4 calories for carbs and protein), so don’t choose a formula that has too much fat in it. As for carbohydrates, stick to highly digestible sources like brown rice, oatmeal, or starchy vegetables, and limit your dog’s fiber intake to 5% or less. You may also want to choose a formula that is supplemented with probiotics for healthy digestion as well as glucosamine and chondroitin to support your dog’s bones and joints so that they remain healthy and able to support your Bulldog’s weight. Another dietary consideration you must make for the Bulldog is in regard to his calorie intake. The average dog needs about 30 calories per pound of bodyweight to support his metabolism – large dogs need a little less and small dogs a little more. As a medium-sized breed, the Bulldog falls somewhere in the middle of this spectrum. Because this is a brachycephalic breed, however, you may want to err a little more on the lower end of the spectrum to prevent your dog from gaining too much weight and becoming obese. Not only does obesity increase your dog’s risk for serious health problems, but it makes the complications of his brachycephalic facial structure more pronounced – Bulldogs are extremely prone to overheating and exercise intolerance. Moderating your dog’s intake to help him maintain a healthy bodyweight is of the utmost importance. The Wellness pet food company understands that meal time is about more than just eating – it’s about nourishing your dog’s body and providing him with the nutrients he needs to live a long and healthy life. Wellness uses only the finest natural ingredients with no fluff or fillers and their products are loaded with natural flavor. This company designs their formulas to offer exceptional nutrition, using premium proteins and digestible carbohydrates to create a foundation for whole-body health and wellness – hence the name. If you’re concerned that your Bulldog may have food allergies, this Wellness Simple Limited Ingredient Lamb & Oatmeal recipe might be a good choice. Not only is this formula made with a novel protein, but it contains a lower number of main ingredients which helps to limit the risk for triggering food allergies. Lamb is an excellent source of protein for dogs and it is a lean source of protein as well which is perfect for Bulldogs. It is also made with digestible carbohydrates like oatmeal, peas, and rice as well as chicory root extract for supplementary fiber. This formula is supplemented with probiotics for healthy digestion as well as chelated minerals to improve nutrient absorption. The FirstMate company is based in Canada but that shouldn’t be cause for concern – they follow the strictest rules and regulations to ensure the quality and safety of their products. This company believes that the best nutrition is simple which is why they use only the highest-quality ingredients in their products and they don’t bulk them up with unnecessary fillers. FirstMate offers a selection of dry and wet dog food products and they make their own foods in company-owned facilities. Furthermore, this company offers a money-back guarantee. The FirstMate Pacific Ocean Fish Meal Original Formula dry food would be a great choice for your Bulldog because it is loaded with premium animal proteins and it is highly digestible. Made with 73% protein from wild Pacific Ocean fish meal and 27% fruits and vegetables, this formula is naturally grain-free so it is less likely to trigger your Bulldog’s food allergies. It is also rich in healthy fats for energy and supplemented with glucosamine, chondroitin, and probiotics. The Evanger’s pet food company is unique in that they offer formulas that are nutritionally balanced for both dogs and cats as well as products for other pets. When it comes to their dog food, Evanger’s offers an assortment of gourmet, hand-packed dinners and balanced meals for all life stages. This company uses only USDA-inspected meats and their products are free from corn, wheat, and soy products as well as artificial preservatives and other low-quality additives. This brand prioritizes balanced nutrition and natural flavor, so your Bulldog is guaranteed to love whatever recipe you choose. This Evanger’s Grain-Free Chicken with Sweet Potato & Pumpkin recipe is a great option to consider because it features protein-rich chicken as the main ingredient with fresh fruits and vegetables as natural sources for key nutrients. It provides 33% crude protein and 16% crude fat, plus probiotics for digestive support and chelated minerals for optimal nutrient uptake. It is also rich in glucosamine and chondroitin to benefit your Bulldog’s bones and joints. As the name implies, the Earthborn Holistic pet food company follows a holistic approach to pet nutrition. Not only do they use only the finest ingredients available, but they fill their products only with the nutrients your dog needs and nothing he doesn’t. This company offers “whole food nutrition born from the earth” to nourish your dog’s whole body from the inside out. This Earthborn Holistic Puppy Vantage recipe is uniquely formulated to meet the nutritional needs of growing puppies like your Bulldog. It features premium animal proteins, wholesome carbohydrates, and added nutrients, not to mention plenty of natural flavor. This formula features protein-rich chicken for a crude protein content of 28% with 20% fat for concentrated energy. It is supplemented with whole grains for carbohydrate energy as well as dietary fiber, plus fresh fruits and vegetables which act as natural sources for key nutrients. You’ll also be glad to know that it is supplemented with probiotics for healthy digestion and chelated minerals for maximum absorption. Any of the four products listed above would be a great choice for your Bulldog, so the one you choose may depend on availability as well as your dog’s own preferences. When making a change to your dog’s diet, be sure to transition him slowly from one food to the next to limit the risk for gastrointestinal upset. Once your dog has made the transition, follow the feeding instructions carefully according to your dog’s weight and keep an eye on his bodyweight and condition to prevent obesity. Your veterinarian can help you keep your Bulldog at a healthy weight which, combined with a healthy diet, is the key to maximizing his longevity so you can enjoy his companionship for years to come.